In a highly anticipated opinion on the legality of CETA’s investment court system (ICS), Advocate General Yves Bot of the European Court of Justice (ECJ) found that “the agreement does not adversely affect the autonomy of EU law and does not affect the principle that the Court of Justice has exclusive jurisdiction over the definitive interpretation of EU law”. This critical analysis of the AG’s Opinion will quickly recall the background and implications of the case before commenting on the most controversial points of the AG’s reasoning. After the recent landmark ruling Achmea, it goes without saying that the ECJ’s verdict in Opinion 1/17 is highly anticipated, as it will provide the same legal clarity with regard to investment agreements concluded by the EU itself. The Court’s response will have far-reaching implications. Not only it will have important impacts on the future of ISDS, it could also disrupt the entry into force of CETA and the ratification process of investment agreements such as the ones with Singapore and Vietnam. In addition, it will also significantly affect the EU proposal for a Multilateral Investment Court (MIC) and, more generally, EU investment policy. This judgment also constitutes the latest development of the Court’s saga on the relationship between international courts or tribunals and EU law.2 The unique features of the EU’s legal order make it difficult for the EU to subject itself to international dispute settlement mechanisms. While the EU has the power to conclude international agreements that set up courts or tribunals that can interpret their provisions, it can do so only if certain conditions are met, i.e. if there is no adverse effect on the autonomy of the EU legal order. The Court has been rather wary as regards international courts or tribunals whose decisions are binding on the institutions, including the Court of Justice.3 The principle of autonomy has consistently been of critical importance for the Court ever since its founding judgment in Van Gend and Loos. Opinion 1/17 is thus of great constitutional significance for EU law. In light of previous and long-standing case-law of the ECJ, the AG’s Opinion is somewhat of a surprise. The intention of this post is not to provide an extensive analysis of the AG’s argumentation, but only to flag some of the most controversial points of his reasoning with which the Court might disagree. After stressing that the preservation of the autonomy of the EU legal order is “not a synonym for autarchy” (para 59), AG Bot explains why the ICS is needed politically. He goes on to deny that Achmea has any implications for the current question ; and consider the safeguards included in CETA sufficient to ensure the preservation of the ECJ’s exclusive jurisdiction over the interpretation of EU law. It is worth noting the considerable time and effort the AG devoted to demonstrating the necessity of ICS in international agreements (para. 71 to 94). The AG argues that the EU cannot necessarily trust the legal systems of third countries with which it might seek international agreements. As such, EU investors do not necessarily benefit from laws and norms providing for investment protection at the same level as in the EU. Since foreign investors enjoy a high level of protection afforded by the EU judicial system and body of laws, EU investors should also be provided with similar standards of protection when operating abroad. It is the AG’s view that this requirement of reciprocity and the need to protect EU investors when investing abroad (1) justifies the need to establish common protection standards through a specific dispute settlement provisions and (2) must be taken into account when examining whether the CETA ICS adversely affects the autonomy of the EU legal order. In any case, consideration of the necessity of the system and the associated merits and problems are arguably outside the scope of the question at issue. The AG should have been solely concerned with whether the system is legally compatible with the EU’s legal order. It is thus highly questionable to make one of the guiding principles of EU external relations a decisive factor in determining whether the autonomy of EU law is sufficiently safeguarded (para 85). The requirement of reciprocity is only one political argument that might be taken into consideration when deciding upon the inclusion of such a mechanism in international agreements. It should certainly not be confused with the conditions the ICS should meet in order to be compatible with EU law. According to the AG, the inclusion of the ICS is further justified by the choice of the negotiators to expressly deny direct effect to CETA (para 93 and 94). As such, in the AG’s view, since investors cannot invoke the agreement before domestic courts, it is justified and appropriate to provide for a separate co-existing judicial system – the two systems provide ‘complementary legal remedies and [are] not substitutes for one another’ (para 168). 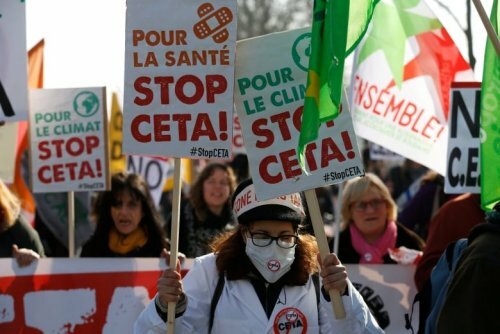 However, while CETA cannot be directly invoked before domestic courts, the agreement is still subject to the doctrine of consistent interpretation. AG Bot then goes on to distinguish Achmea from the case at hand. In Achmea, the question related to an intra-EU Bilateral Investment Treaty (BIT), whereas the current question is about an extra-EU agreement concluded by the EU itself. On the basis of such distinction, he rapidly concludes that the “approach in Achmea cannot be transposed to the ICS” because (1) the premises that must guide the reasoning are different (mutual trust versus reciprocity) and (2) the applicable law before the CETA Tribunal consists only of the agreement itself ; EU law can only be taken into account as a matter of fact, and the interpretation of domestic law is not binding (para 106 to 110). However, the reasoning of Achmea applies beyond the context in which it was decided and the principle of mutual trust. It may thus also be applied to agreements between the EU and third countries.6 Departing from Achmea enables AG Bot to avoid the obligation to thoroughly assess whether the ICS mechanism meets all of the conditions set up in previous case law, including in Achmea. After having discarded any implications of Achmea for the present case, the AG looks at the safeguards included by the Commission to accommodate one of the key constitutional flaws of ISDS under EU law : its incompatibility with the EU Treaties. Article 8.31 of CETA seeks to preserve the powers of the ECJ and the autonomy of the EU legal system by limiting the powers of the Tribunals in relation to domestic law. The AG more or less repeats the arguments put forward by the Commission during the hearing and, 7 overall, considered himself satisfied with these safeguards. He concludes that the ECJ’s exclusive jurisdiction has been sufficiently shielded. Indeed, the power of the Court to interpret EU law in a definitive manner is an intricate issue. However, that does not mean that the principle of autonomy ought to be reduced only to the preservation of the exclusive competence of the ECJ in the definitive interpretation of EU law (para. 70 and 114). The concept of ‘autonomy’ goes beyond the Court’s interpretive monopoly over EU law. Whether the formalistic precautions set by the Commission are sufficient to take into account the fundamental concerns regarding the compatibility of the agreement with the EU Treaties, are therefore very questionable. Various concerns have been raised in this regard.8 Indeed, there are “plenty of things that can go wrong”9 and there is no doubt the Court will have something to say about these. Finally, a last striking aspect of the AG’s Opinion concerns the fact that the AG does not consider the necessity to exhaust domestic remedies before going to CETA Tribunals. Although, the fact that investors do not have to go to domestic courts first is a common feature of most BITs, 12 it is still very problematic under Article 19 TEU and in sharp contrast to the ECtHR system. This issue is further exacerbated by a ‘no-U-turn’ clause in CETA, which forbids the investor to return to the domestic courts. It remains to be seen whether the Court will follow his line of reasoning. Should the Court rule in favour of the ICS, it would not only go against settled case-law, but would also allow the EU to subject itself to a dispute settlement mechanism that empowers multinationals and rich individuals with additional rights. This would be in stark contrast with the fact that the EU decided not to be bound by the rulings of the ECtHR, a dispute settlement mechanism that shares a number of similarities. In any event, it will be thus very interesting to see what the Court thinks of a parallel private judicial system that grants additional protection to privileged foreign investors. 1. In Opinion 2/15, the ECJ indicated that investor-state dispute settlement (ISDS) ‘removes’ disputes from the jurisdiction of EU courts, although it could not answer whether the system was legal under EU law because it was outside the scope of the case. Then in the recent landmark ruling Achmea, the ECJ found an intra-EU Bilateral Investment Treaty (BIT) incompatible with EU law because the ISDS provisions it contains sideline and undermine the powers of domestic courts. 2. See Opinions 1/91, 1/92, 1/00, 1/09 and 2/13 . 3. In Opinion 2/13, the ECJ rejected the EU accession to the European Convention on Human Rights (ECHR), because it would allow the European Court of Human Rights (ECtHR) in Strasbourg to interpret EU law without the involvement of the ECJ.